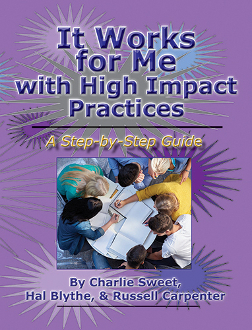 High impact practices are a twenty-first-century phenomenon, but if you’ve read any of the authors’ books, you know, for instance, that for many years they have been collaborating, instructing undergraduates how to research like full professors, and teaching writing intensive courses—in short, employing some high impact practices, even though, back then, they were merely effective teaching strategies. What impresses the authors the most about HIPs is that they have been rigorously assessed, and no doubt remains that they work, resulting in deeper learning. Moreover, what started as a top-ten practices list has already grown to eleven with the demonstrated efficacy of the e-portfolio. And that list will surely grow as more and more research is performed.